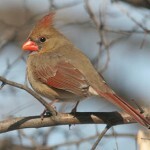 Description: Yellowish eyebrow; thick, dark bill; and chestnut wing coverts. 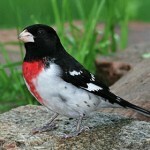 Breeding male has black bib under white chin; bright yellow breast; whitish belly; grayish-black crown and cheeks; and brown, sparrow-like upperparts. Female lacks black bib; yellow breast; grayish sides; paler chestnut wing patch. Immatures are paler overall with some streaking on breast and sides. Habitat: Grasslands with a combination of tall grasses, forbs, and shrubs. Also found in various croplands, especially alfalfa and clover. 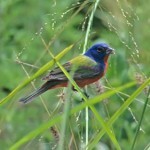 Where in Nebraska: Common to abundant spring and fall migrant and summer resident across the state, except in the Panhandle where it is uncommon to rare. Field Notes: Often heavily parasitized by Brown-headed Cowbirds. 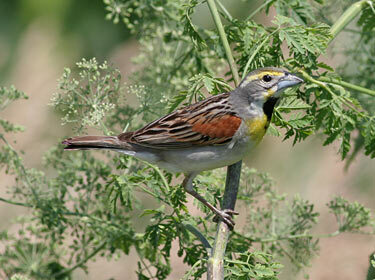 Fun Facts: During migration, Dickcissels’ flocks get larger and larger until they reach their wintering grounds with over a million birds.